We attended the ‘techniques mixtes et dimensions variables’ vernissage at galerie kreo last evening. 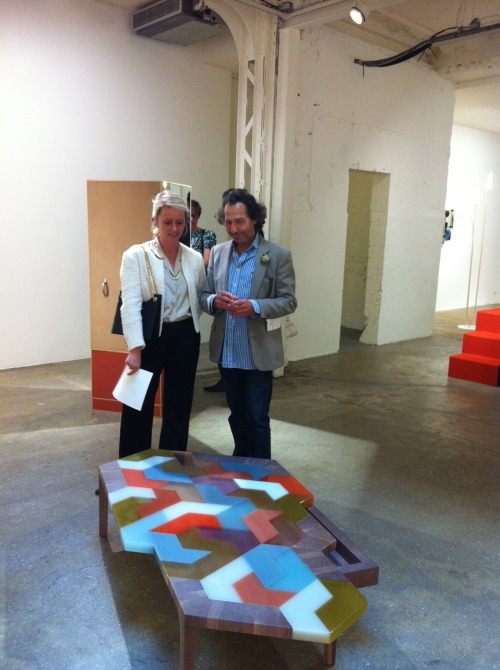 Susan is standing behind Hella Jongerius’ 2008 Mini-Swatch low table. (Jongerius also produced a smaller version.) A graduate of the Academy for Industrial Design, Eindhoven, and former member of the renowned dutch group droog design, Jongerius has created a body of work that weaves between the boundaries of craft, art, design and technology to exceptional results. “I’m designer who uses a lot of ingredients to get to a product. Not only form, but also history, tradition and contemporary inspiration. And I like to mix craft with industry.”—Hella Jongerius for design boom.